3 Bedroom End of Terrace House For Sale in Chesterfield for Offers in excess of £150,000. 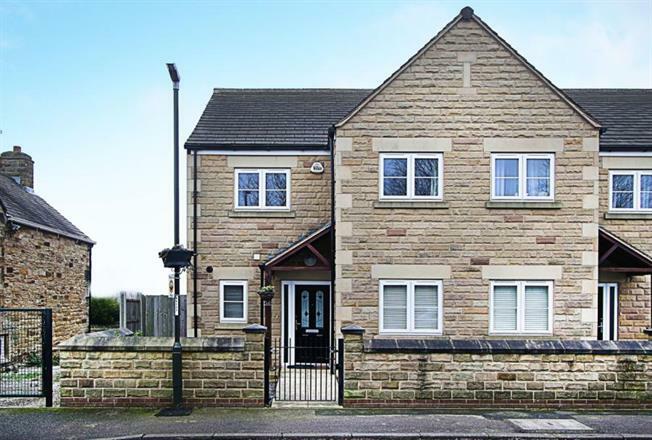 Offered for sale with NO CHAIN is this beautifully presented three bedroom stone fronted property with gas central heating. Finished to a high standard internally the property also benefits a south facing rear garden with far reaching views. There are two assigned courtyard parking spaces. Viewing is highly recommended to appreciate the accommodation it has to offer. The property briefly comprises: an open plan living space of lounge, dining area and fitted modern kitchen. Downstairs WC, understairs storage cupboard and a multi purpose room. Upstairs are three good sized bedrooms the master having an en-suite toilet, wash hand basin and power shower. There is a further family bathroom with toilet wash handbasin with hydro therapy whirlpool bath with shower above. Feature tiled wall. The suburb of Staveley is situated a short distance from the A619 Chesterfield, M1, Worksop Road and is convenient for Staveley shopping centre, regular bus services and high street. Staveley has recently had a newHealthy Living leisure centre built in the centre which provides a fitness room, swimming pool and spa to name but a few. Staveley also falls within great school catchments to include both Springwell and Staveley junior schools and Netherthorpe Science College Comprehensive.